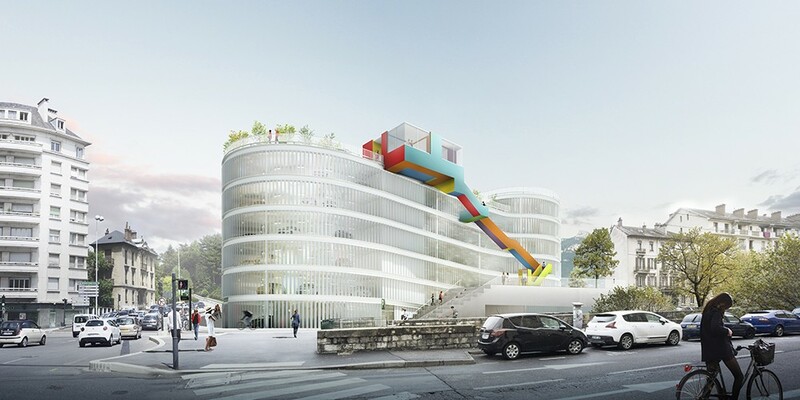 Following a public service delegation consultation, Q-Park has just won the tender set up as part of the "Mobile territory" project (projet Territoire mobile) for the city of Chambéry. The DSP contract covers a global project including the construction of 2 new structures, the operation of 5 surface car parks and the rehabilitation of 5 existing underground car parks. The contract will begin on September 1,2017 for a term of 30 years. At the end of the municipal council meeting held in Chambéry on 12 July 2017, Q-Park France was notably awarded the contract to build 2 new car parks, the Ravet car park and the Cassine car park. In addition to these two new structures, the public service delegation covers various works carried out in 10 of the 13 parking lots in Chambéry's inner-city area, as well as their operation and the management of 5 surface parking lots in enclosures. This extended perimeter will ensure consistency of parking in the Chambérian city centre. The amount of investments for this work is estimated at 35 million euros (excl. VAT). The Ravet car park: this emblematic structure, located on the historic axis of the city and at the entrance to the city, will include a photovoltaic power station on its roof, which will cover 1/3 of the electricity needs of the car park. A panoramic belvedere will be built on the latter and a monumental staircase, designed by the artist Krijn de Koning, will be integrated into its façade. This park will open in January 2019 and will offer nearly 500 parking spaces on 7 levels. The Cassine car park: designed to promote urban integration, this car park will link three neighbourhoods: Cassine, Faubourg Reclus and the multimodal interchange centre (known as PEM). For an excellent integration in the urban landscape, Q-Park has chosen to green the facade and roof while installing wind turbines on it. It will be delivered in October 2020 and will offer nearly 500 spaces on 4 levels. The internal circulation of vehicles with notably the elimination of traffic conflicts, the optimization of traffic directions, and the optimization of entry and exit channels, recognized expertise of the Q-Park group. A few years ago, the City of Chambéry and Chambéry Métropole embarked on a policy of restructuring mobility in the territory through the "Mobile Territory" project. The objective is to enter into a modern and sustainable mobility approach, working on the complementarity of transport modes. The Chambéry metropolitan area wishes to improve the daily life of its inhabitants and develop its attractiveness for investors, industrialists, tourists and visitors. It also wishes to convey the image of a modern, peaceful and pleasant urban area. It was necessary for the City of Chambéry to improve its parking offer and modernize its facilities to ensure a better flow of traffic in the city centre and in car parks, to ensure a high level of safety and to comply with the new regulations in force. Driven by a heritage vision, this ambitious technical and aesthetic project will be inspired by the strong visual identity of the City of Chambéry, its history, architecture and colours. Q-Park wished to associate with this program the urban scenographer Art Entreprise, the signalman Mengzhi Zheng, as well as the artist Krijn de Koning to harmonize the different works of the city by creating a real urban scenography. Integrating structures into the landscape, park compliance, security and customer experience are all part of Q-Park's know-how. Q-Park France also has a multidisciplinary and experienced team. Indeed, the company will work with several architectural firms (HAA Firm, Philippe Barbeyer, MH1 Architecten), the Arcadis project manager, the Elan design office or with construction companies consulted in both steel and concrete construction. "We are passionate about this city project, which allows us to highlight our creativity, our technical know-how, our expertise as a modern parking manager and our desire to create real synergies between car parks and downtown merchants. This contract is a testament to the confidence that the city of Chambéry has placed in us, and we will be keen to accompany it in its future developments as well as in the urban dynamics of the city centre and the evolution of its image that it wishes to develop. The in-depth work of our teams with local Chambéry players, our innovative and technological service offer and our relevant financial proposal have enabled us to emerge among our competitors "said Michèle Salvadoretti, General Manager Q-Park France.